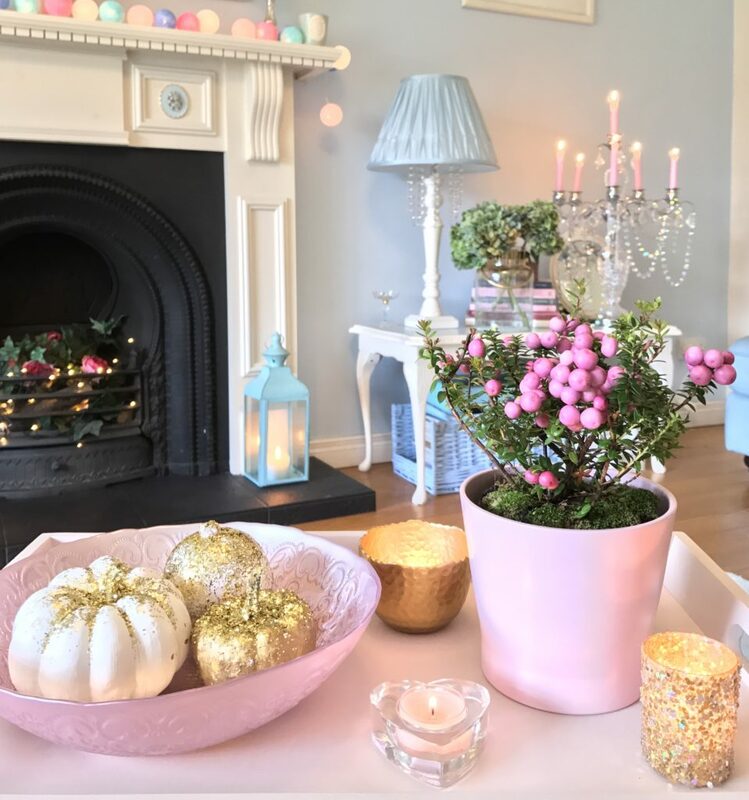 As the nights get darker and there’s a little nip in the air I must admit I immediately start to think about all things cosy & Christmassy! 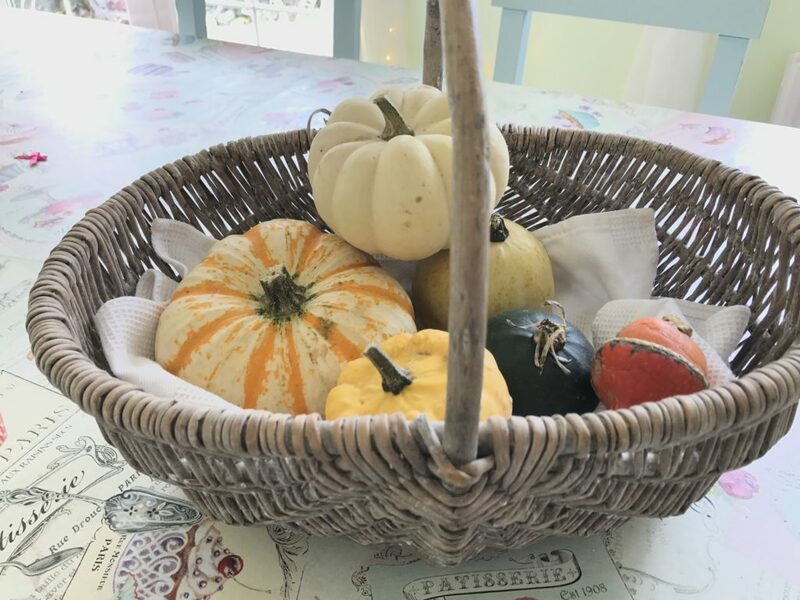 Warm blankets, hot chocolate with marshmallows & cinnamon candles are all on the agenda and although I love autumn as a season with it’s beautifully changing colours and crunchy leaves underfoot I’m not a huge fan of reds & orange so I don’t use traditional autumn colours in my decor. 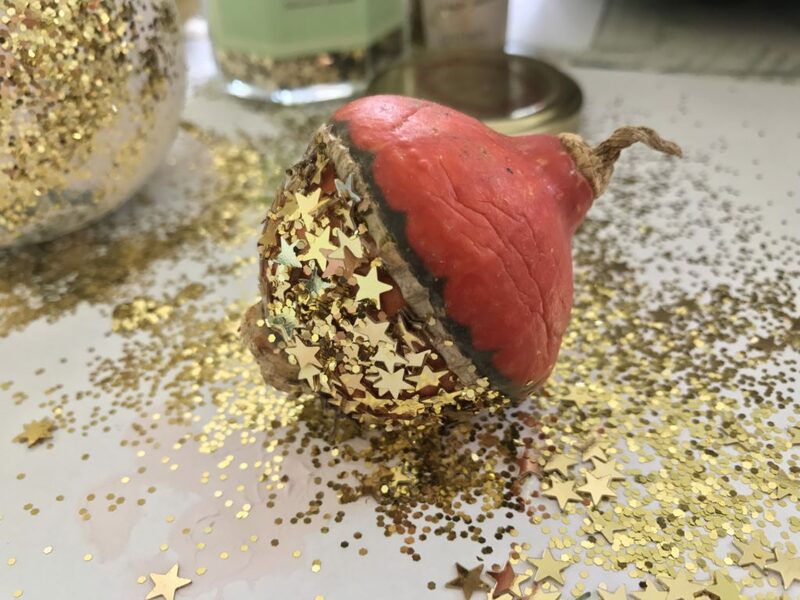 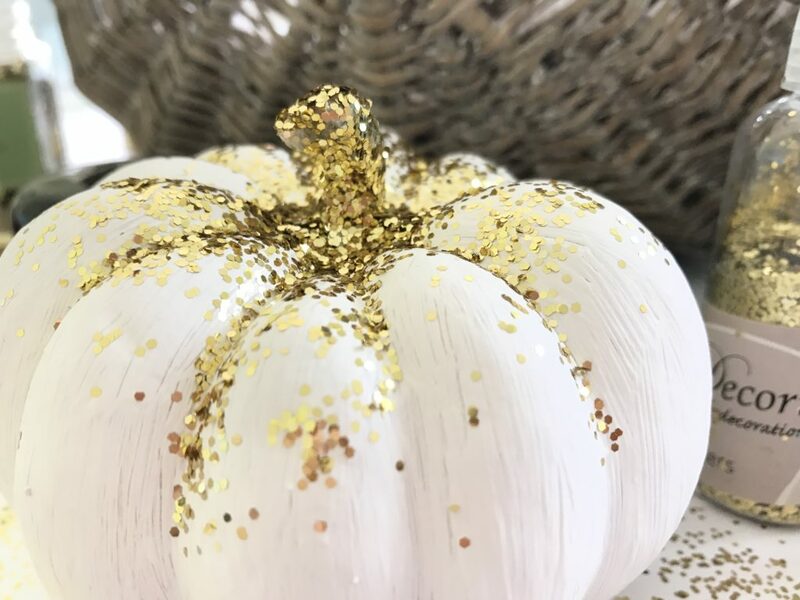 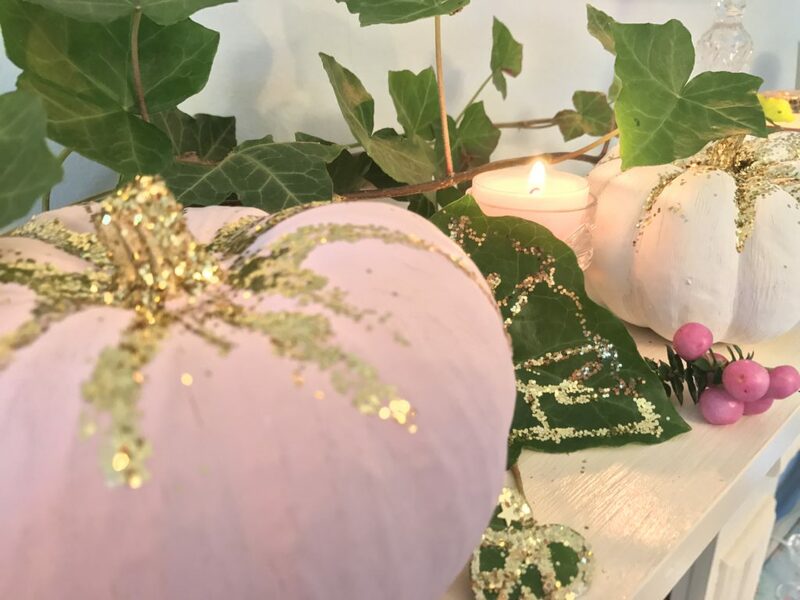 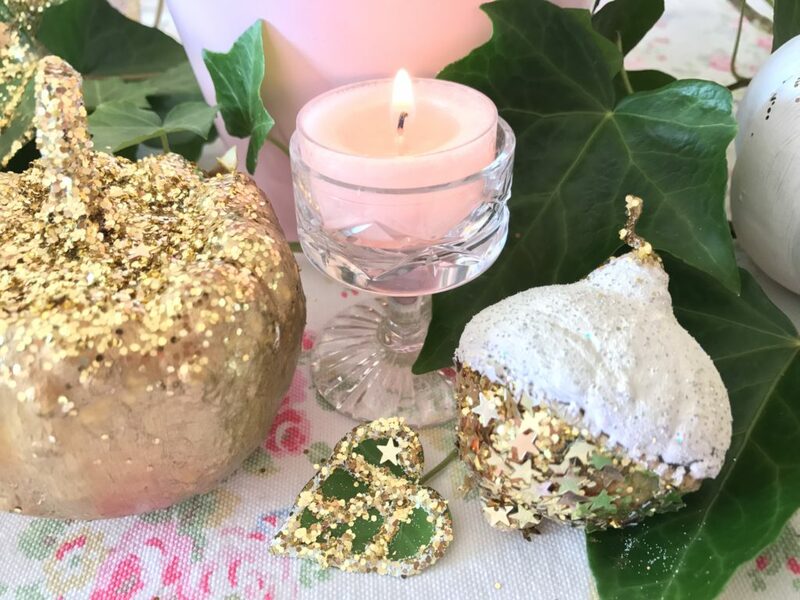 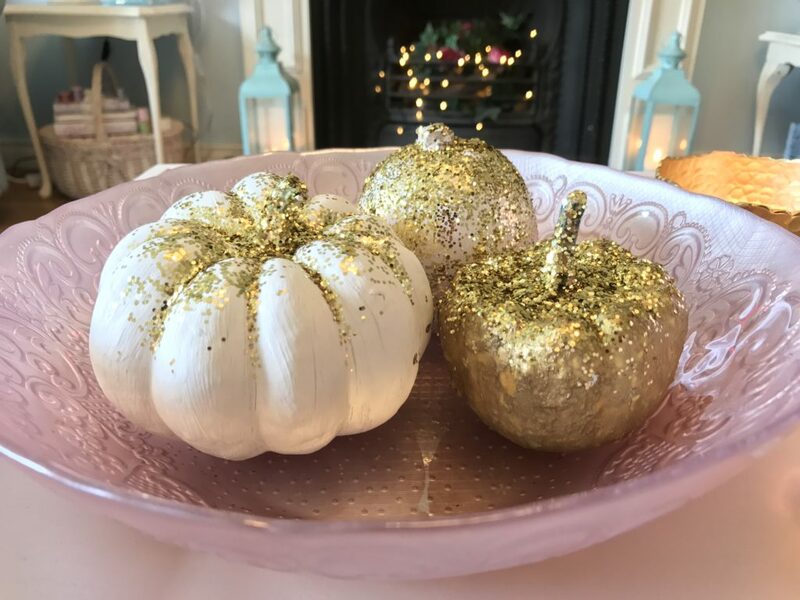 I do love the golden hues of autumn so when I saw these beautiful pumpkins in my local garden centre I immediately saw their potential and brought them home and got to work transforming them with some paint & gold glitter. 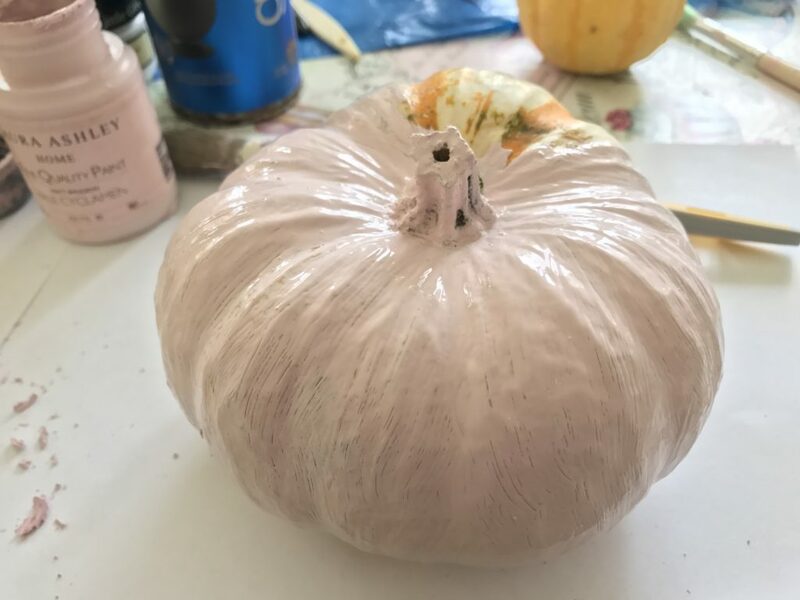 I gave them all a wash with soapy water and then dried them so that they were ready to paint. 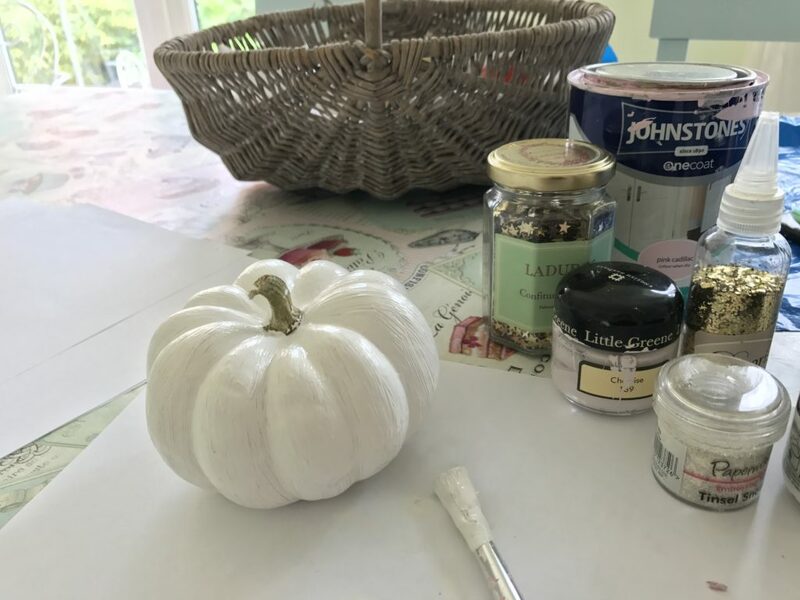 I find the easiest way to paint them is to sit each pumpkin on a separate piece of A4 paper as this allows you to turn them round whilst painting. 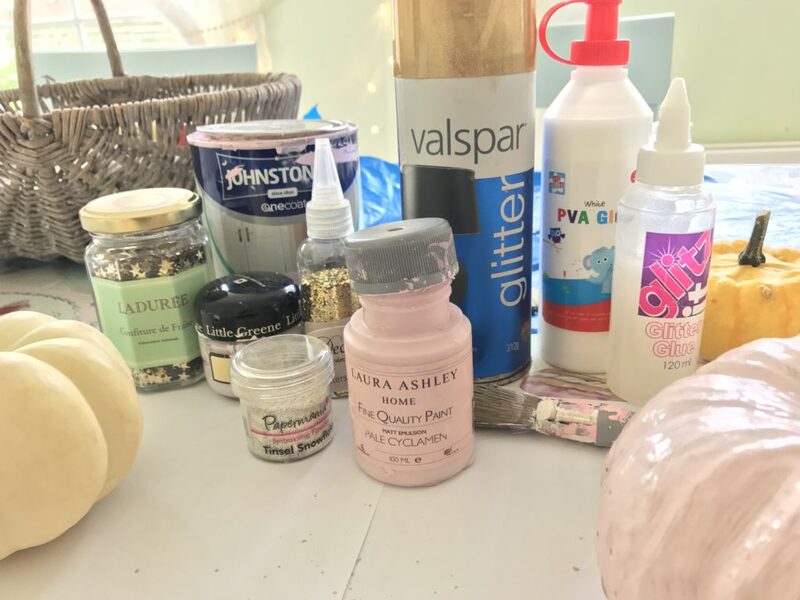 I have a box of supplies for this sort of crafting project with tester pots of paint, glue and glitter etc so I got them all out and started painting! 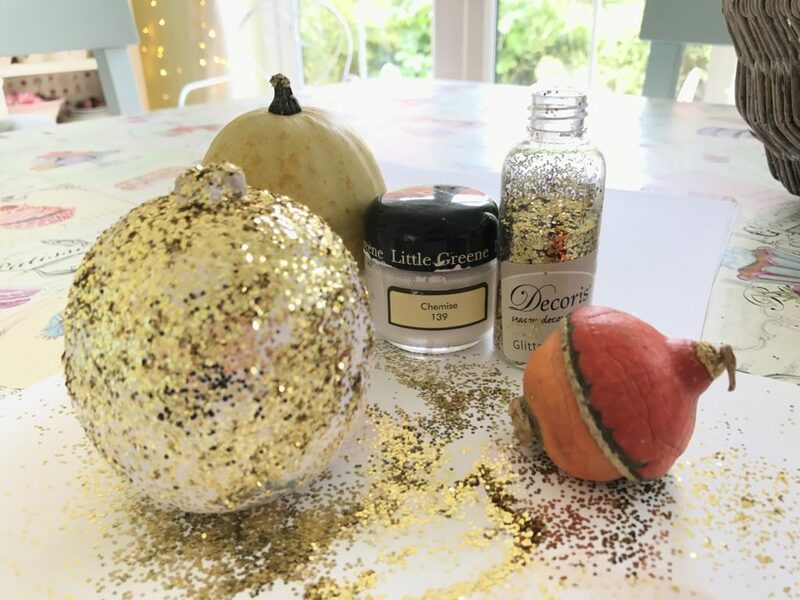 Once painted you can leave to dry before decorating further with sequins etc but with some of them I sprinkled gold glitter onto the wet paint which works well without having to use glue. 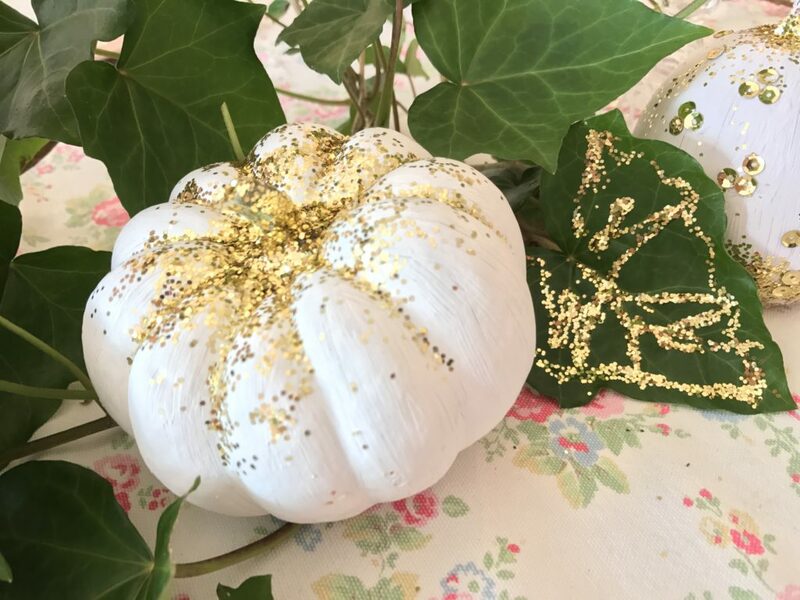 I painted the little yellow one gold and then sprinkled the stalk & top of it with gold glitter which looked very effective. 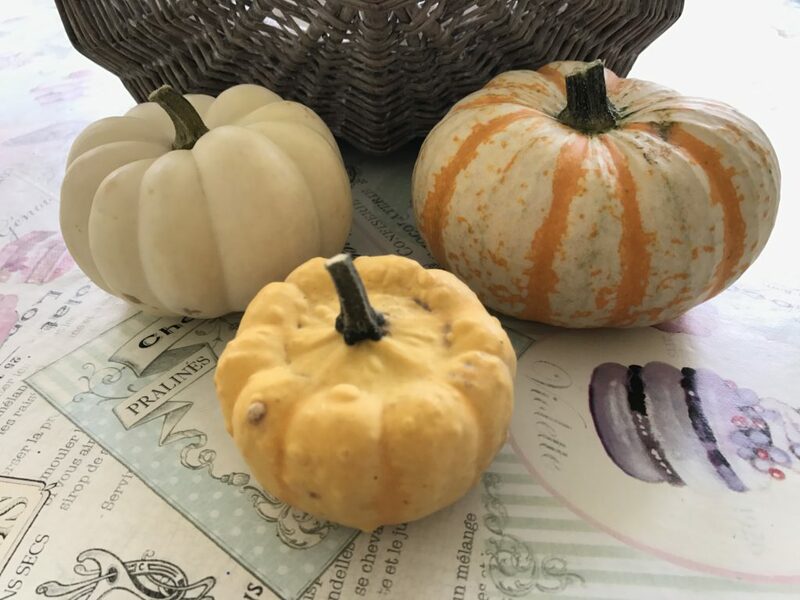 They look super pretty grouped together on a pretty plate or dish and make the perfect centrepiece for an autumnal table or just sitting on a coffee table or displayed on a mantelpiece with some ivy and candles. 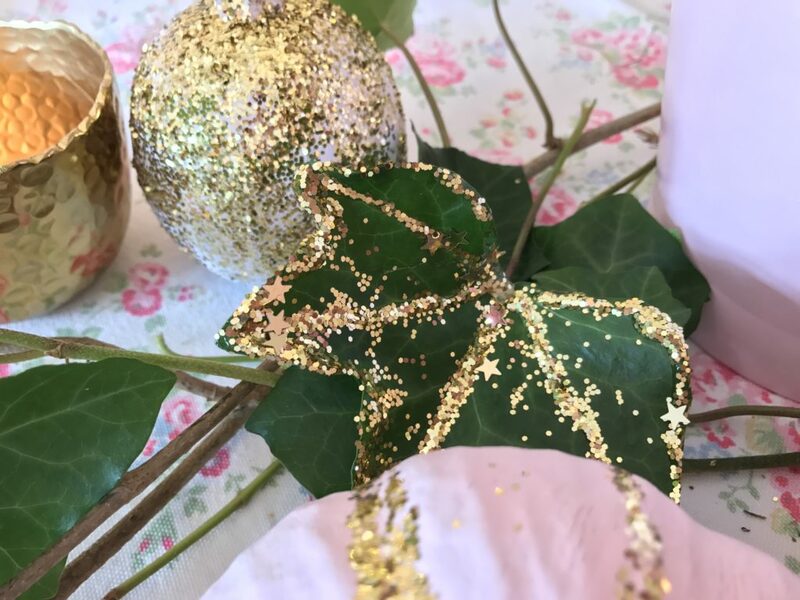 To decorate my autumn table I cut some ivy from the garden and placed it aong the centre and then snipped a few leaves off to decorate with gold glitter. 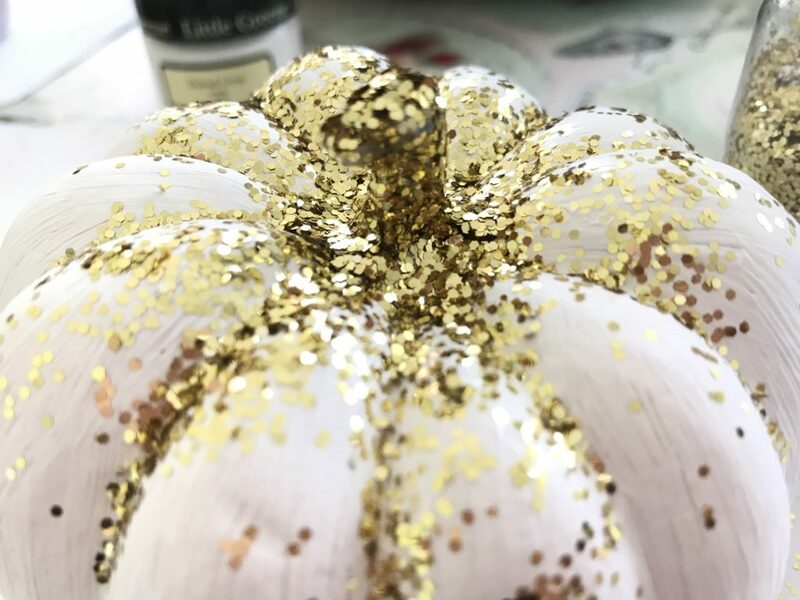 This is really simple to do as you just go round the edges and lines with the glue and sprinkle with glitter then shake gently to remove the excess. 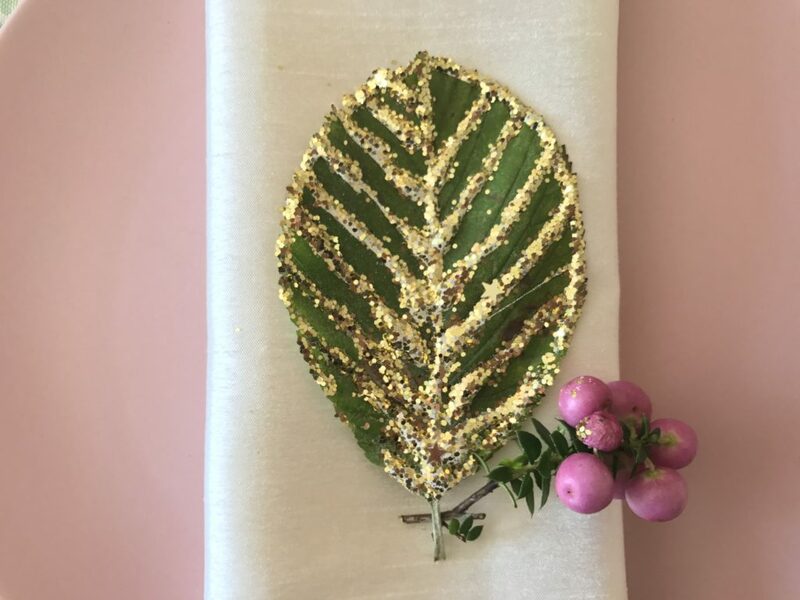 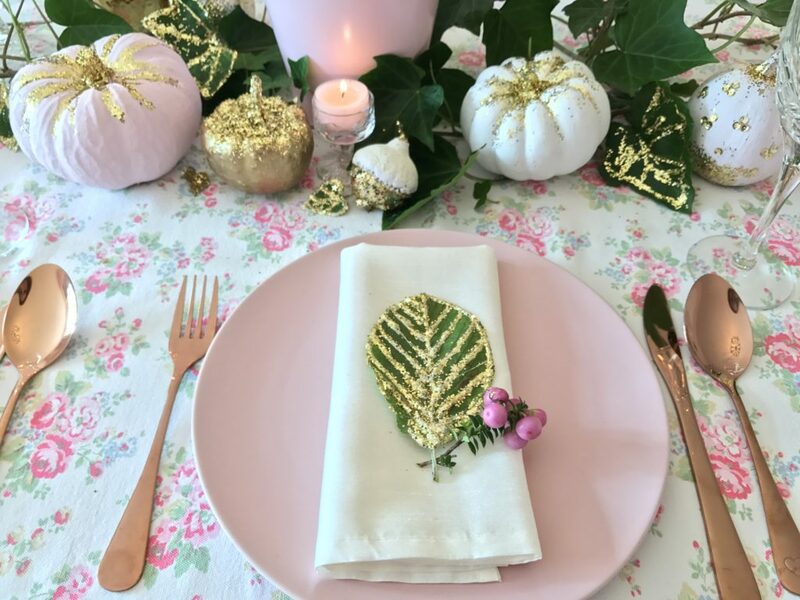 The leaves can then be placed into the ivy to add a bit of sparkle and are also lovely as napkin decor at each place setting. 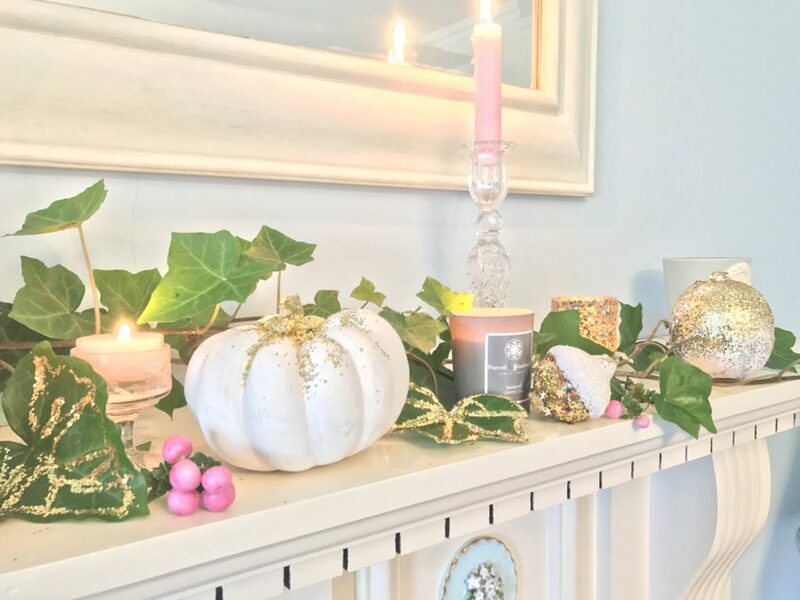 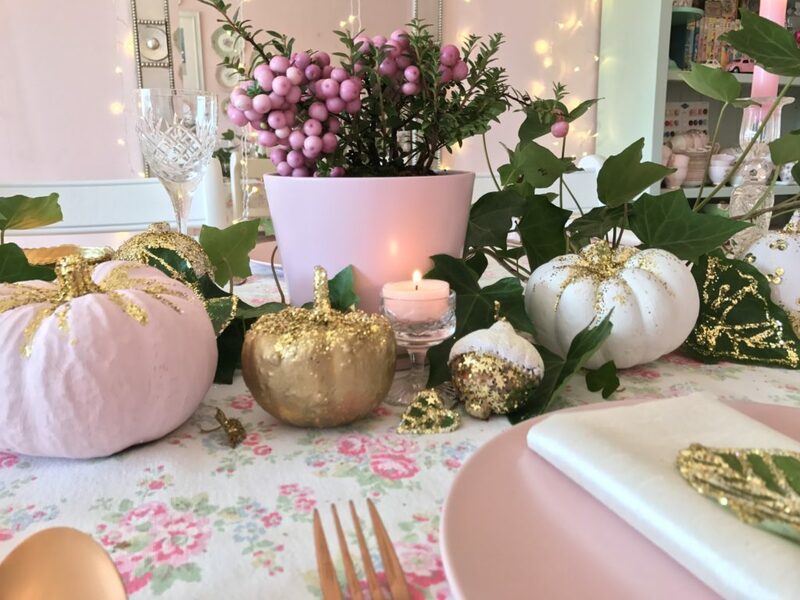 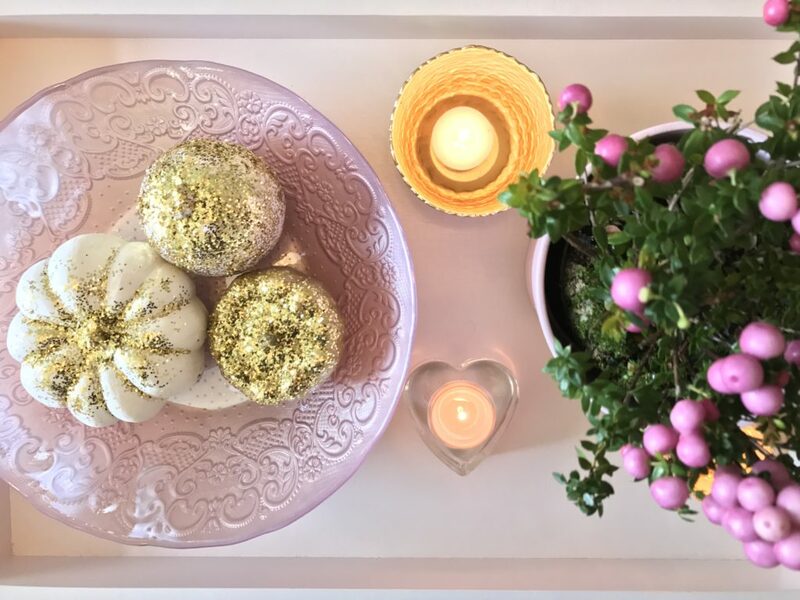 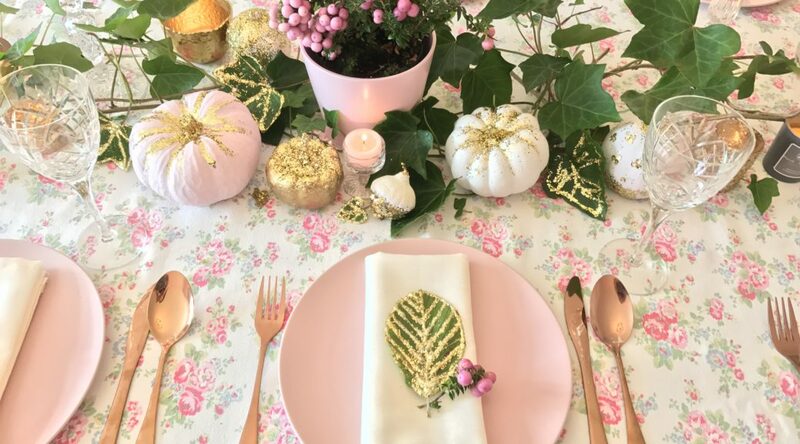 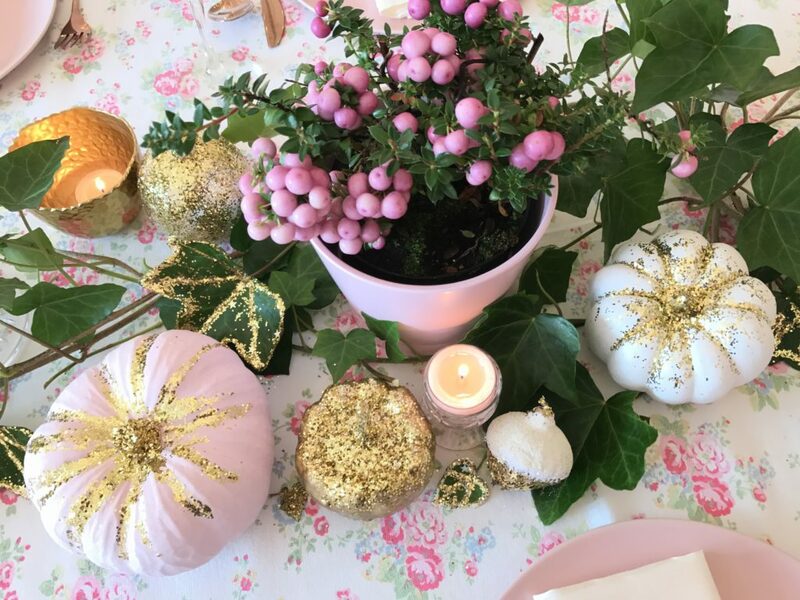 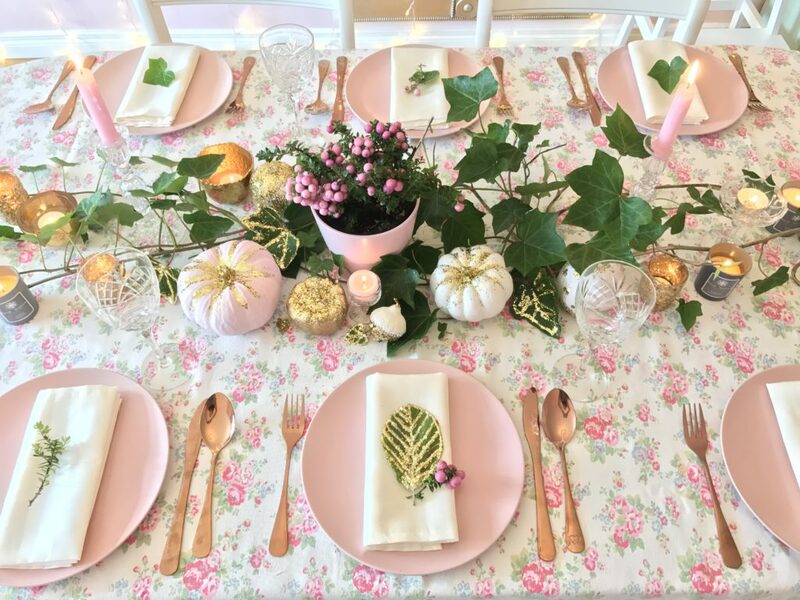 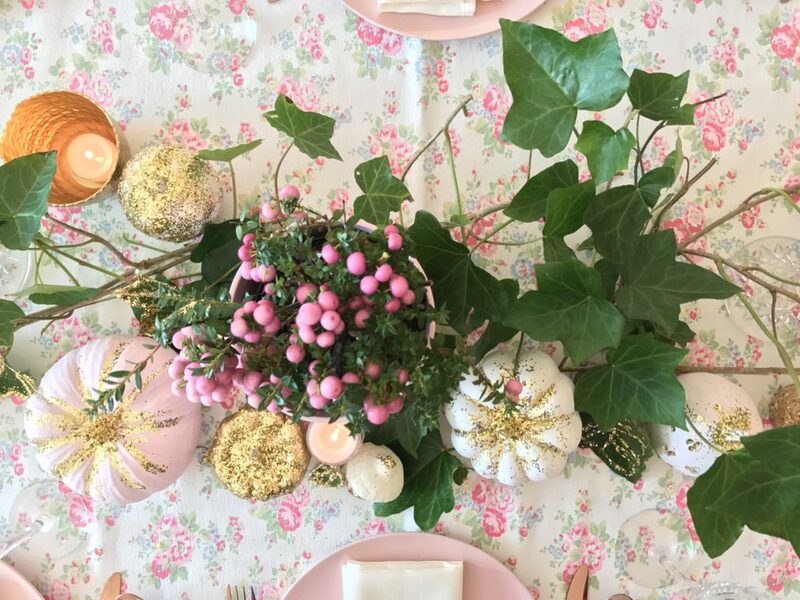 I then sat the decorated pumpkins around a little pink pot of pernettya with lovely pink berries and dotted candles & tealights along the length of the table. 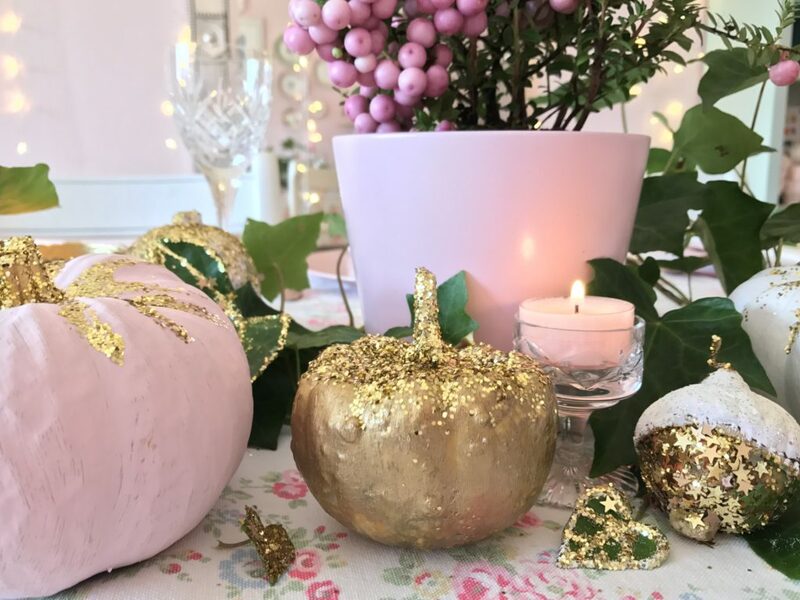 So that’s my pink & pastel version of autumnal decor sorted with enough glitter to keep me going till Christmas!